Every since a child I have been an avid bicycle fan. I rode my sturdy single speed bike all over the hills in Southern Indiana where I grew up. I remember my friend Jim Elliott and I riding five miles to Rising Sun and five miles back after running Cross Country. I figure I got more exercise on the bike than running Cross Country! As a student in Lubbock, TX (1973-75), I rode four miles to school and four miles back every day. 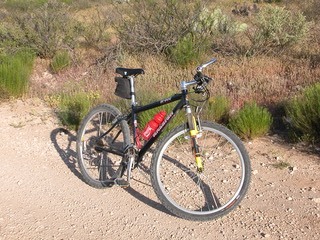 Later I began mountain biking on a Schwinn Mesa Runner. 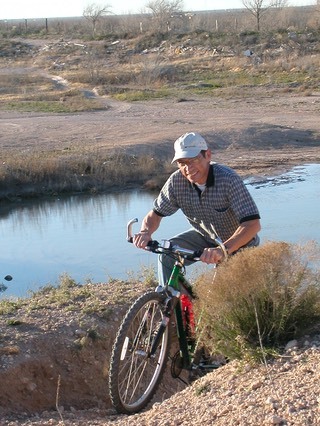 For my 50th birthday, my son, Gary, helped my get a Raleigh M-80 mountain bike. The endless miles of rough oil field roads make ideal trails for mountain biking. I now ride a light weight Raleigh M-800. I turned 65 on March 20, 2012, and still ride my bike every chance I get. I always make sure I have my digital camera and harmonica to keep me company. My wife, Gail, bought me a Trek X-Caliber 9 Mountain Bike for my 70th birthday on March 20, 2017. My Raleigh M-800 - The Ultimate Machine! This bike is much lighter than the M-80. 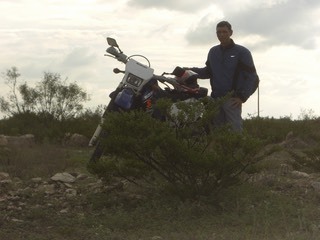 Here I am with my son's Suzuki DRZ-400S dual-sport motorcycle. 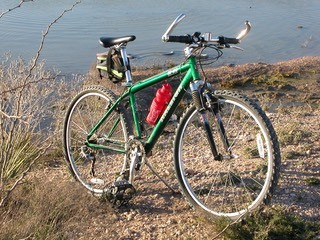 Above is my Trek X-Caliber 9 Mountain Bike that my wife bought me for my 70 the birthday. After moving to East Odessa two years ago, I joined the Permian Basis Bike Club. 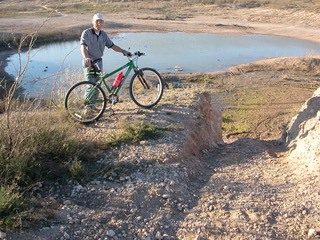 I ride every chance I get at the Permian Basin Mountain Bike Park located behind the Fire Station on Eastridge. You will need to pay a $25.00 annual fee to join the Permian Basis Bike Association in order to ride at the park. There are lots of great trails for every level of competence. Fortunately, i live just one mile from the park. The outer riding trail that i like to ride is four miles. I broke my right wrist at the park early this summer, but am on the mend. A great bike is like an extension of your body. It replaces tired, worn joints and inelastic ligaments. Since you can maintain heart and lung power well into your sixties, the bike becomes a fresh, elastic young new set of ligaments, muscles, and joints. Knowledgeable exercise physiologists call the bicycle the ultimate time machine. Training on a great bike rewards you with a dynamic cardiovascular system, springy, powerful muscles, and the body of as much younger man. Exercise physiologists asked to pick just one piece of exercises equipment for a desert island most frequently select a bicycle. They know they can get strength, speed, endurance, agility, balance, and coordination training all on a single piece of equipment that is also a lot of fun. Here is the absolutely best web site for learning about the history and operation of bicycles. The Exploratorium Science of Cycling web site: Exploratorium This web site is loaded with valuable information. There are articles to read, diagrams to examine, beautiful pictures to look at, and even movies to watch. Ted Talk by Anthony Desnick: The Amazing Way Bicycles Change You. Many of the books available on the Pilates Method are extremely complicated. For anyone interested in the original book written by Pilates himself, you can purchase it at: A Pilates' Primer : The Millennium Edition This is actually two books in one: Return to Life Through Contrology, and Health. Anyone interested in fitness will benefit from the Active Isolated Stretching exercises mentioned in Dr. Bob Arnots' Guide to Turning Back the Clock mentioned above. I benefited from these exercises for over a year until I found the Pilates' exercises. Pilates and AI are both very effective in overcoming back problems. Purchase Dr. Arnot's book at: Dr. Bob Arnot: Turning Back the Clock. The exercises in Dr. Arnot's book are sufficient for most people, but if you are really interested in learning more about Active Isolated Stretching (AI) you will certainly want to purchase the original, breakthrough book on the subject: AI Stretching: Jim and Phil Wharton. I recently purchased an Octane xRide Seated Elliptical Cross Trainer. It is a new class of exercise equipment that is a brilliant cross between a recumbent bike and a elliptical trainer. It is the one machine that will build muscle, develop flexibility, and promote high level cardiovascular fitness. It can be used by people of all ages and levels of fitness from the virtually handicapped to super-athlete. 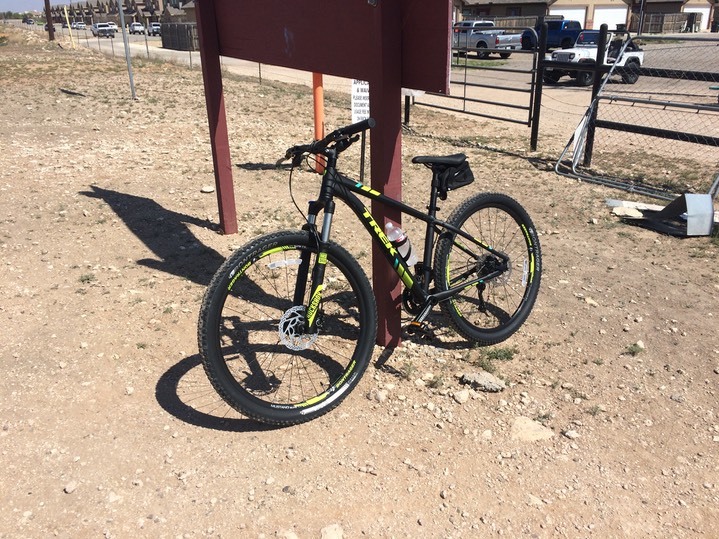 I purchased my xRide from the good folks at Fitness Specialty in Odessa, TX. Here is a YouTube overview of the XRide. This is THE machine to buy if you want to really get in really good overall physical condition. Here is a more detailed YouTube clip showing the many features of the program XRide. It is an amazing piece of exercise equipment for the price. I am able to get my heart rate up to +130 BPM in just a few minutes. It is an essential part of my weekly exercise routine. I highly recommend it. Urban Rebounder Folding Trampoline Workout System. *The Story of the Urban Rebounder. CERG: Cardiac Exercise Research Group. Great information on the benefits of intense interval exercise. A lot of people these days experience a lot of stress. I recommend Archibald Hart's Adrenaline and Stress: The Exciting Breakthrough that Helps You Overcome Stress. His book Thrilled to Death is also very good. Here is Charles L. Allen’s Prescription for Meditation on Psalms 23. I used it to lower my blood pressure back in 2014. For the contribution good nutrition can make to your health, check out Dr. Greger’s NutritionFacts.org website. His 2016 book, How Not to Die, is a best seller.